Yasutoshi Yoshida a.k.a Government Alpha is one of the hottest and harshest of the young Japanese artists looking to fill the shoes of the old-timers like Hijokaidan, Merzbow, Incapacitants, Masonna and so on. 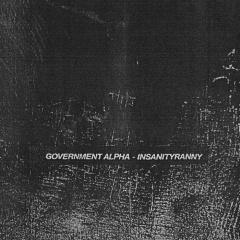 Government Alpha stands out above the heap of noise coming out of Japan. His label Xerxes has released countless cassettes and CD-rs from artsists like Facialmess, Napalmed, Skin Crime, OVMN, Knurl, S.Isabella, Lasse Marhaug, T.A.D.M., Astro, Kapotte Muziek and many more. Recorded at Xerxes studio during 2010/2011. Cassette case with 4-panel J-card.